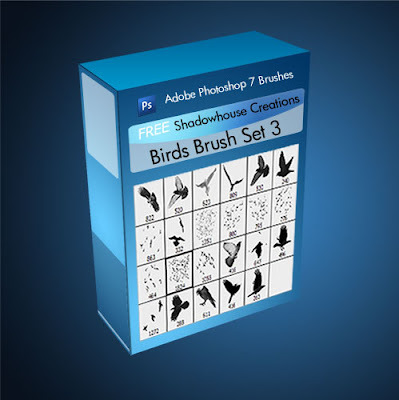 Shadowhouse Creations: Shadowhouse Creations " Birds Brush Set 3 "
Thank you Jerry. Very generous. Are these really free? You are so cool Jerry - thank you!! fabulous brushes - thanks for sharing! Thank you sooo much for this great brush-set! Hi Jerry - Any chance these might work with psp? Sorry, I'm not sure, I no longer have PSP installed on my PC. You can give it a shot, and if you do, would you be so kind as to let me know what version PSP you're using if it works, so I can let others know. Thanks--I really like these birds! Thank you so much--from a bird & brush nut! Thank you again for allowing to use your work, especially for free. I enjoy everything that you offer. Wow, Jerry. These are even better than your last set. Thank you so much!! Jerry, this is for you! Thanks for the great brush set! Wonderful composition, and the background photo is so serene. Thank you for your generosity - you are talented and I enjoy using all your creations. These are awesome. thanks! BTW, love the new blog look! Thank you, what a great set. Excellent brush set. I really want to try them out. Thank-you, you added a little excitement to my day!!!! Thank you! 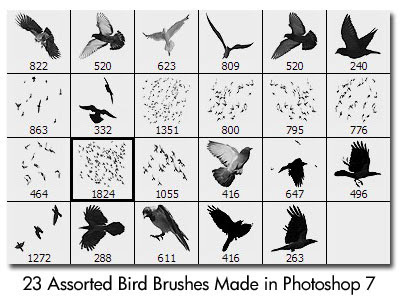 To be honest, I have not used your bird brushes in a project yet. But I am thrilled that you included some pigeons in the collection. Pigeons are my favorite bird, and they're often maligned or at least underrated. You've depicted them so beautifully here I could not resist, and I'll definitely find a use for them. Again - thank you! Thank you Jerry. These are lovely. Beautiful set. Thank you for your generosity and artistry! I must learn to download these...cant wait...so beautiful brushes! Jerry, Thank you so much for your generosity! !